Having written web content and copy for over 15 years now, it is funny to see how far we have come and how much competition is out there now. When I started this particular blog about 8 years ago, it was still relatively easy to find good solid keywords and to get them to rank well on the search engines. Today that process will definitely take more time and dedication to accomplish. But with a little thought and a bit of planning, you can get your new site or current site to rank much more highly relatively quickly. I am assuming that you are not already a post writing ninja and that you would like a little back story as to how posts and sites actually rank in Google. I am not going to be considering Bing or Yahoo in this post as they are much smaller players and send a fraction of the traffic to my site that Google does. Currently I get about 20,000 hits a month to my site so not a paltry amount and not a huge, giant site (yet). My goal number is to get to 50,000 by the end of the year which will require me to do a LOT of targeted, keyword rich writing. I target three different high level keywords for my whole site, Entrepreneur Marketing, Realtor Marketing and Author Marketing. Depending on how dedicated I am to each generally ebbs and wanes, with them coming in and out of the top 100 on Google from time to time. Those three keywords that I am targeting are pretty high level and important keywords. Getting my site to rank for them with just one post or page would be difficult to say the the least. So to start, you need to pick three high level keywords that you would like your site to rank for (or which it already does rank for). Once you have your site’s three main keywords, each post you write should support those in some way. For example, I would write a post called The Top 50 Best Kinds of Realtor Postcards | Realtor Marketing. For this example post I was trying to rank for both Realtor Postcards and Realtor Marketing. Note: That little line in there is called a “pipe” and is found above the shift key. I like to use it because it is a neutral in programming language so it won’t mess up my HTML code. When I am thinking about what to write I try and make sure it fits into one or the other of my sitewide keyword “buckets”. Does It Match What Your Site Is Already About? Unless your website is brand new, you probably already rank in search for some keywords, you just may not be in the top rankings yet. The easiest way to quickly increase your rankings is to double down on what Google already thinks your site is about (as long as it is at least a little relevant to your 3 Site Keywords. You can find out what your site already shows up in searches for by using the Google Webmaster tools. This will give you a list of the keywords that people have already used when trying to find information like you have on your site. Pro Tip: As you get more and more keywords, don’t forget to “add them up” to get a true picture of their sitewide impact. For example I have hits for Customer Demographics, Consumer Demographics, Demographic Age Groups, etc. These are all contributing to the hits that my site gets and are superb terms to use for blog post titles and content. It is much easier to ride a wave of what Google thinks your site is already about than to try and randomly pick new words to rank for. This low hanging fruit is a great way to increase your rankings. Pro Tip: Google really does add up all the little bits of your blog to create a comprehensive idea of what your site is about and what you should rank for. You need a lot of posts about a topic to let the search engines know to rank you for that keyword. Once you have a few less popular keywords, then you can add them up to start ranking for a “big” keyword. So now you are to the post you are writing and what keywords you should use. Having the right ones will mean the difference between lots of traffic from the search engines and crickets when no one comes. I have a GREAT example of this. I wrote a great post about 100 Email Headlines. I spent hours collecting them and putting them in order. And then at the last second right before I hit publish, I thought…hmmmm maybe I should check and see if that is a good keyword. So I hopped over to the Google Adwords site to do some research. Holy cow…there are only 40 searches per month for Email Headlines and over a thousand for Email Subject Lines! Had I not taken those couple of extra seconds to check, I would have missed getting over 68,500 hits to my website over the years as of today! Pro Tip: You don’t necessarily have to do this on every post, but if you are taking the time to write something longer, it is definitely worth the time to do that one little step! One last thing to consider when you are working on an important post’s keywords is whether the keywords you are targeting are just BIG keywords or “buying” keywords. I could target a term like “marketing” but that is so broad that 1) I could spend the rest of my life trying to get to page one and 2) I probably wouldn’t sell a whole lot if I did start to rank to for it. Ranking for terms like Entrepreneur Marketing are much more likely to result in sales and new people on my email list! Make sure to check and see if you are targeting a buying or just a BIG keyword. Last but not least you want to see how many directly competing sites there are for the keyword that you are targeting. 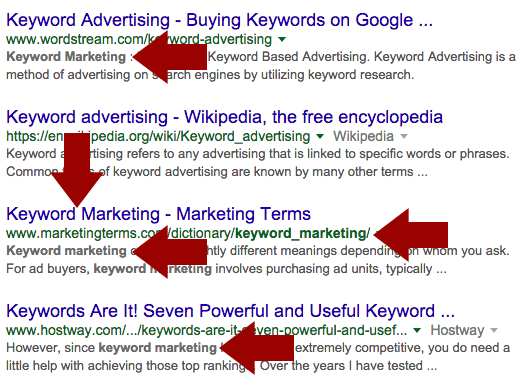 This post’s main keyword that I am trying to rank for is “keyword marketing”. When you do the search on Google you want to put parenthesis around your target keyword so it only shows those exact words in that exact order. There are 179,000 competing sites with that exact phrase in the title of their page or post. That is a little high, but considering “marketing” alone is 1,690,000,000 (yes that is almost 1.7 BILLION competing sites) I am okay with it. 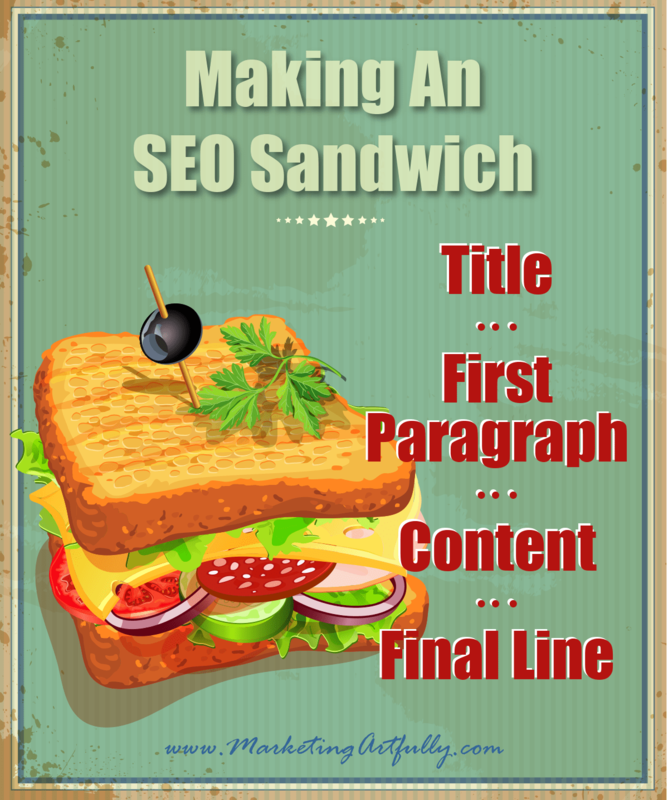 I always think of my keyword marketing in a blog post like making a sandwich. 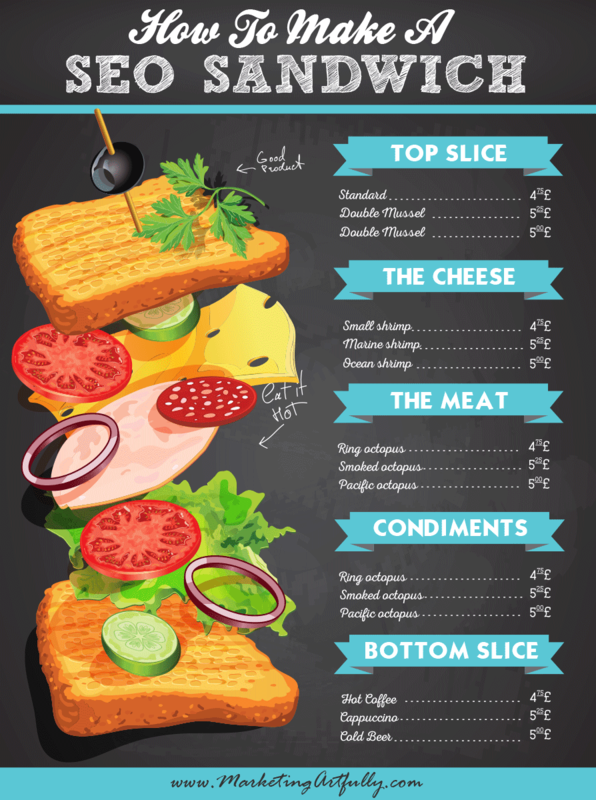 There are two pieces of bread, top and bottom, one piece of cheese and then the meat. If you always think of your blog post writing this way, you will be able to rank highly for a variety of keywords. You have been doing all that keyword work so you have an amazing title for your post! Make sure you use your keywords in the first part of your title. As you can see, only one of the first four results has it in the title, having it in your first paragraph and in your search engine description might even be MORE important. Then you want to go ahead and write your content out. DO NOT try to be overly concerned with getting your keywords in there right now! Instead you want to have a lot of information that someone could actually use that is related to your post title. I like to finish my posts with that same keyword phrase, just to put an ending exclamation point on it! You should post as often as you can write great content. That said, I KNOW that when I post multiple times a week or daily that my traffic from the search engines go up. Google has a part of their algorithm that values recency so keeping your content fresh is a great idea for increasing your search rankings overall. Additionally, it takes a lot of work to rank in the search engines and if you are posting once a month or even every couple of weeks, it will take you YEARS to rank for anything. Google has said that they would like posts to be at least 300-500 words long. That said, if you are writing an authoritative hero blog post that you think will help your site a lot, go long. If you think about it, a long blog post just makes sense. Google is a simply a database of words that it sorts. If you have only a few words, you will have less of a chance to rank than if you have a lot of words. My “normal” posts are about 800-1,000 words. The ones that rank most highly in the search engines and are generating the most hits are the Email Subject Lines post (2,393 words | 1894 hits last month), Keywords For Realtors (597 words | 1387 hits last month) and Customer Demographics For Advertising (647 words | 905 hits last month). 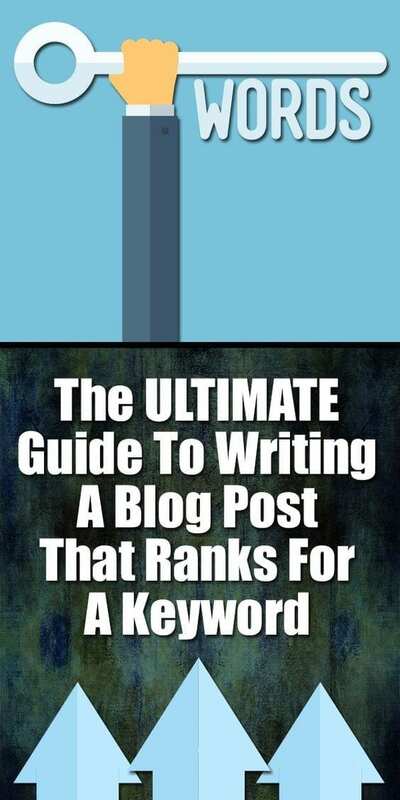 So you don’t have to have super long posts to rank well for key terms and to get traffic, you just have to have great content that is congruent with what your title it! There used to be a “ratio” of how many times you should use your keywords compared to non-keywords in your content and you wanted to be around 2-3% I think. Well that is NO MORE! One of Google’s updates years ago fixed this “keyword density” problems because humans hate to read gibberish and if you have your keywords every other sentence it doesn’t read very well. We have all come upon an article that has been “stuffed” that is impossible to read, don’t be that guy! Instead just write great content and be mindful of ranking at the beginning and end! Google does think that if you are emphasizing something by putting it in a heading or making it bold that they should notice that more and weigh it more heavily. I have found that to be true when doing my keyword writing. So if it is appropriate, make your paragraph section titles Heading 3 or 4 or bold or italics. Whatever your theme makes look the best. What you DO NOT have to do is use one H2 tag, one H3 tag, one H4 tag, one italics and one bold like I have read somewheres. Just have some kind of normal convention that you follow across your site so that it looks good for humans and is easy to read. I use H3 and Bold tags the most, you check out your theme and use what looks nice! If you can cite a source in your article that goes to an “authority” site that matches your content, this is a great idea. For example, I have a couple of links out to Google Webmaster Tools and Google Adwords. Because I am talking about keyword marketing and SEO, linking to those sites makes a lot of sense and should help show that I am a legit writer. Internal backlinks mean that you are linking to content within your website from your website. The cool thing about this is that you can control the keywords that you use which helps to tell Google what your site is about. DO NOT try to link the same keyword to the same page in EVERY one of your posts. Google will figure this out and either ignore or penalize you for doing that. Just do it naturally as something comes up that is relevant and you will be just fine! Well there you have it! 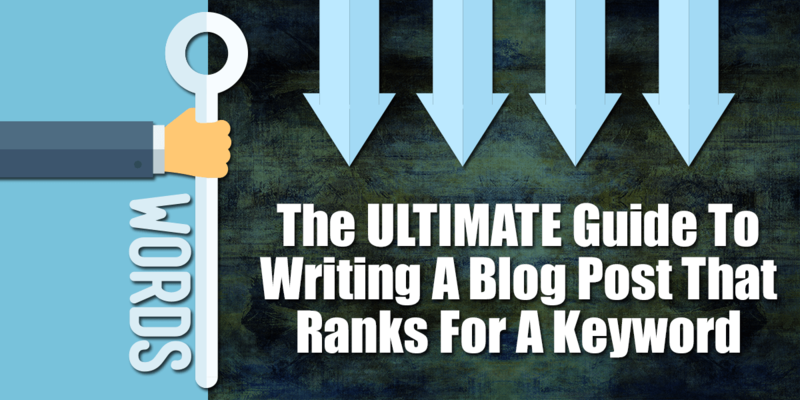 My giant, humongous guide to writing a blog post that ranks for a keyword. I wrote this Keyword Marketing post for one of my coaching clients, the FABULOUS Erika Page as she is starting her blog out, Living Luxury Atlanta. If you want to learn more about how to make an SEO Sandwich (and get higher listings in Google), check out my SEO Sandwich Report and Video Bonus! Learn all the steps to having a perfect SEO Sandwich and see how to do more of what we talked about today in the 15 minute bonus video! Click here to get the report and video walkthrough! Previous Post: « What Do You Do With A Wicked Good Idea? Which Gets Blog Traffic Fast and Easy… Google or Pinterest?